Each day, the Chignecto-Central Regional Centre for Education's fleet of 200 buses transports over 17,000 students to and from schools across the region. In a given year, CCRCE buses travel more than 1,000,000 kilometers. To manage our fleet, CCRCE employs a Coordinator of Pupil Transportation and a Pupil Transportation Foreman at our four bus garages: Central Area (Cobequid Family), Hants East Area (Nova Family), West Pictou Area (Celtic Family) and Cumberland County Area (Chignecto Family). 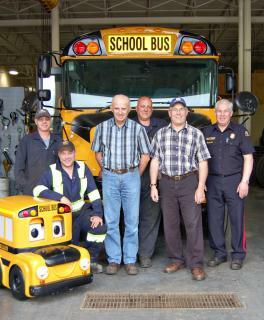 You can also contact the Coordinator of Pupil Transportation at 902-896-5561.